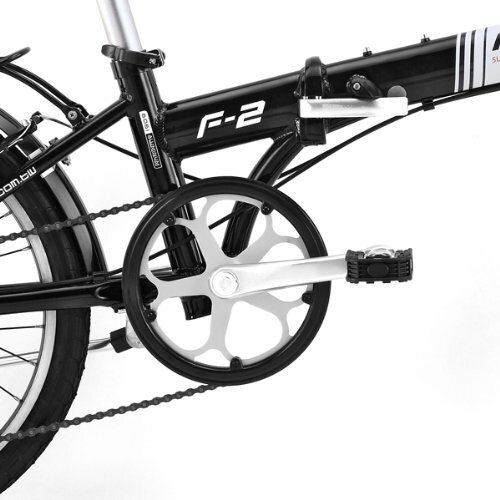 A highly functional folding bike with a modern and sleek design. 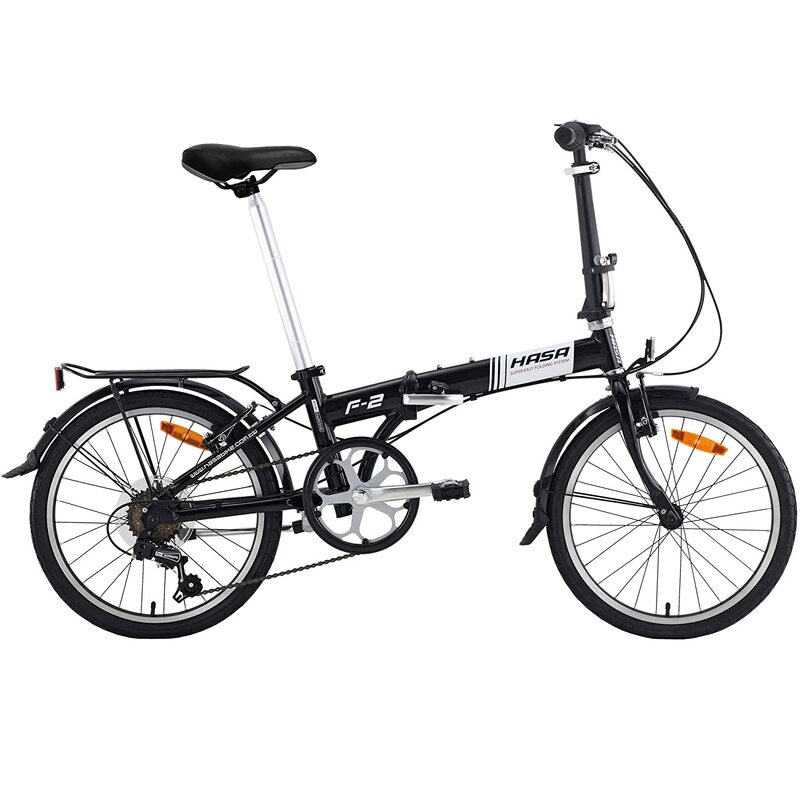 The HASA SRAM 6-speed folding bike offers consumers a very attractive and affordable price of under $300 for such an innovative product with a design and style that fits a variety of consumer personalities. 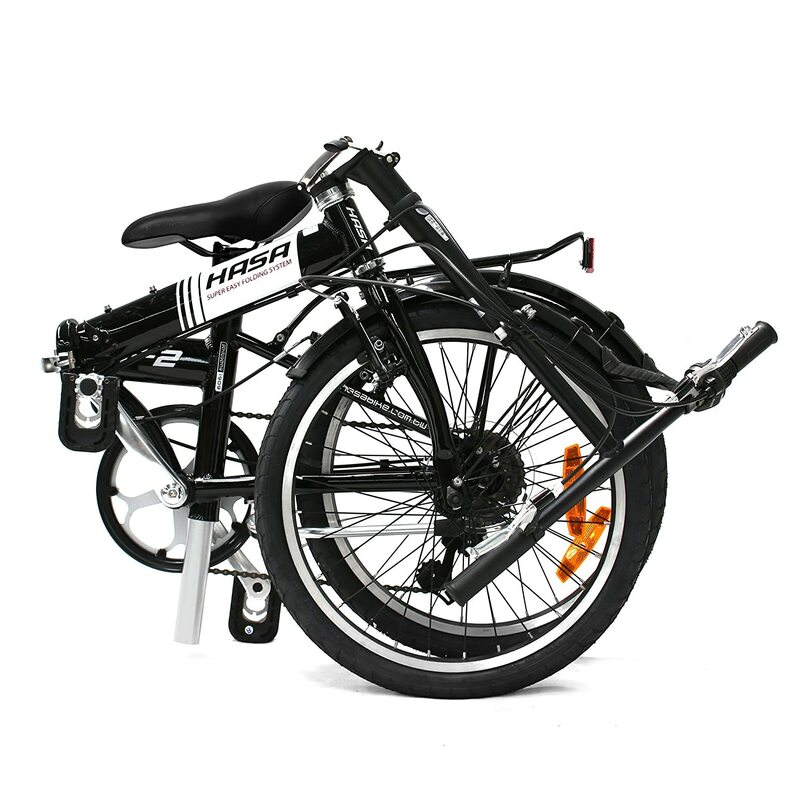 Whether you are an employee who enjoys daily commutes to the office on your bike, a student who wishes to venture to class each day, or just an avid health conscious individual that enjoys the exercise and leisure activities of bicycling, this Hasa folding bike is sure to satisfy all your bicycling wants and needs. Click to Check Price Now! This innovative bike, weighing 27.5 pounds and requiring little to no assembly at all, with its extraordinary, durable features offers the cyclist a 6-speed bicycle with 20-inch alloy wheel rims designed with stainless steel spokes and equipped with state-of-the-art Kenda tires, measuring 20″ x 1.5 K-193. This bike, though a folding bike, is both safe and comfortable for riders from 4’8″ up to 6’3″ in height and weight of up to 240 pounds. The folded size of this bike measures in at 33″ x 25″ x 13″ and its folding and unfolding procedure is easily accomplished within 15 seconds. ​The frame is painted with either a clean black or a white color and is donned with an artistic strip down the body. ​The adjustable seat will extend up to 21.5 inches accommodating riders of varied heights and sizes and the fork, made from the very same aluminum 6061 alloy as the frame itself, is stiff and durable. ​Attached to the fork are the handlebars which are flat styled, made of aluminum alloy as well and measure in at approximately 20 inches long. These handlebars are fixed not allowing for any adjustments which, however, does not seem to afford any issues or problems to riders since the seat post itself is adjustable. ​At the end of the aluminum alloy crankset are the pedals that are typical in design and present with no advanced composition. The bicycle gears shift with incredible ease and offer a smooth transition from gear to gear while riding and even when going up and down hills. The performance of both handles and gearshift is excellent and the overall performance of the bike is top notch, firm and remarkably smooth. ​Further features that accompany this innovative bicycle are the mudguards for both front and rear tires that serve to control and defend against water, puddles, mud, and any other weather and road conditions. If you have ever ridden a bike without mudguards then surely you can appreciate the notable value these simple add on mudguards bring to an already well-crafted bike. 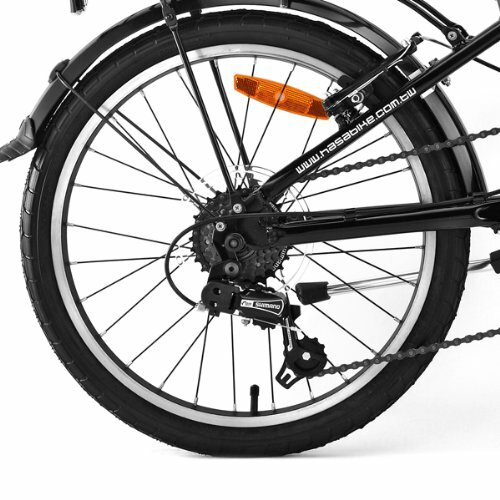 The HASA SRAM 6-speed bike also comes equipped with a rear steel rack that is remarkably useful to the rider who needs to transport work carry cases, school book bags, and even groceries if need be with the simple addition of one of two bungee cords that will offer added security as you ride. ​The abundant advantages discussed above of the HASA SRAM 6-speed bicycle are many. First and foremost the performance, the reasonable and affordable price, the aluminum alloy 6061 body and frame, attractively groomed/painted finish, lightweight, 20″ alloy wheel rims and stainless steel spokes, state-of-the-art Kenda tires, adjustable seats, varied height and weight accommodations, flat handlebars, easy shift gears, aluminum alloy crankset, mudguards, steel rear rack, and easy to use fold up feature are among the attractive features. Though this HASA SRAM 6-speed bicycle offers excessive advantages and pros there are a few minimal disadvantages to the bicycle as well. For starters, the fixed flat handlebars that are not adjustable may very well present an issue to some riders, the pedals that are somewhat inferior and have been reported to be slippery and unable to grip the bottom of the cyclists shoes. The mere fact that the added little accessories, specifically the mudguards, are made of a low grade plastic are the minor disadvantages and cons to this HASA SRAM 6-speed bicycle and quite minimal in comparison to its excessive pros and advantages. All in all, this champion of bicycles built to last, offers the cyclist, whether business man, student, or fitness conscious individuals, performance, safety, comfort, confidence and is not only highly visible on the market today but is also greatly recognized and favored in the industry.